Event – Luana This Thursday! Join us on Wednesday, September 3, for a very special undergraduate seminar! Our guest speaker is Professor Masato Wakayama, from the Institute of Mathematics for Industry at Kyushu University in Fukuoka, Japan. 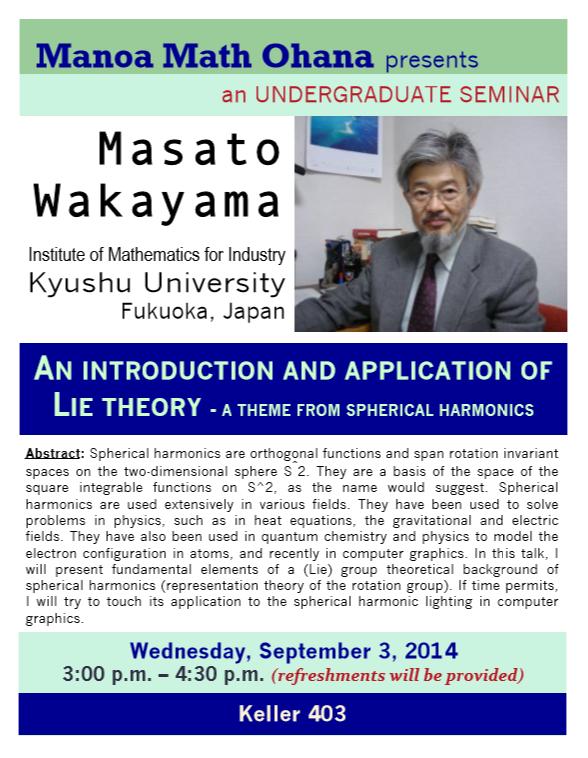 Professor Wakayama will be giving a talk entitled An Introduction and Application of Lie Theory – A Theme from Spherical Harmonics. Spherical harmonics is used in quantum physics, quantum chemistry, and even computer graphics! Come and learn more about this exciting field, and of course, we will provide snacks! Welcome to another university year! Let’s fill it with great adventures in mathematics! We are the Manoa Math Ohana, a mathematics club here at the UHM. If you are not already a member of this family of mathletes, now is the time to join! Please meet us this week to sign up for membership. The time has come to nominate and elect officers to lead the Manoa Math Ohana for the Fall ’14 semester. If you would like to be an officer, please fill out the Officer Nomination Form; read this to learn about each officer’s duty description. To be considered for nomination you must be an MMO member and plan to attend UH Manoa in the Fall’14 semester. If you are not a member and would like to be, please visit How To Join. The Officer Nomination Form will be available until 8:00pm Tuesday, April 29. Then, on May 1, MMO members will receive an email listing the officer nominees and voting instructions. Voting will remain open for approximately 2 days. To vote, you must be an MMO member. If you are not a member and would like to be, please visit How To Join. Event: The Last Luana of the Semester!! 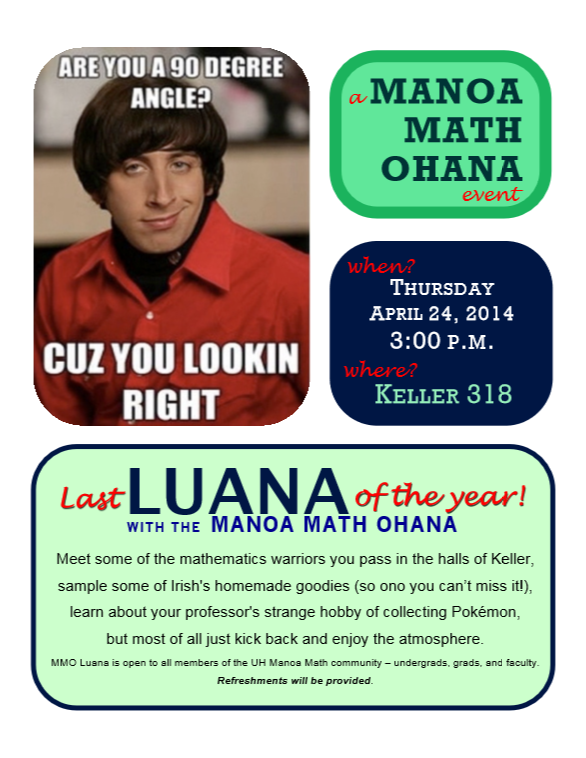 Please join the Manoa Math Ohana for the Last Luana of the School Year!! 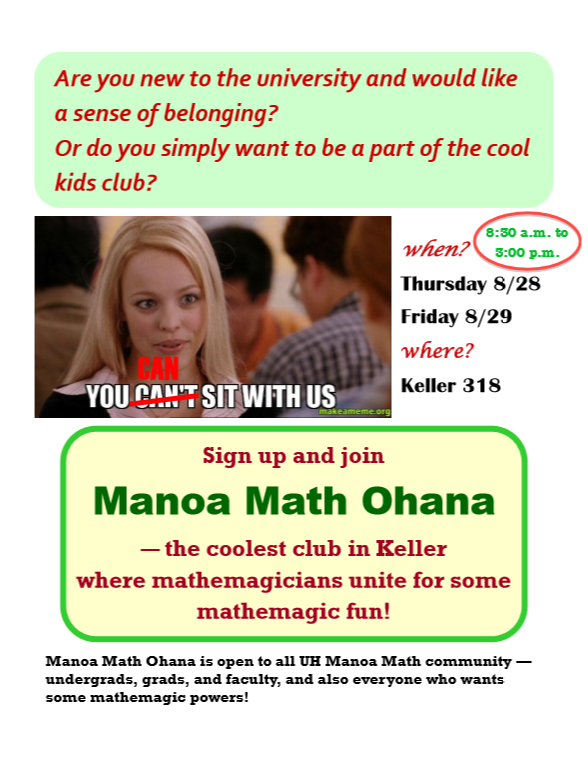 This is your chance to meet some of the mathematics warriors you pass in the halls of Keller, to sample some of Irish’s homemade goodies (so ono you can’t miss it), to learn about your professor’s strange hobby of collecting Pokémon, but most of all to just kick back and enjoy the atmosphere. 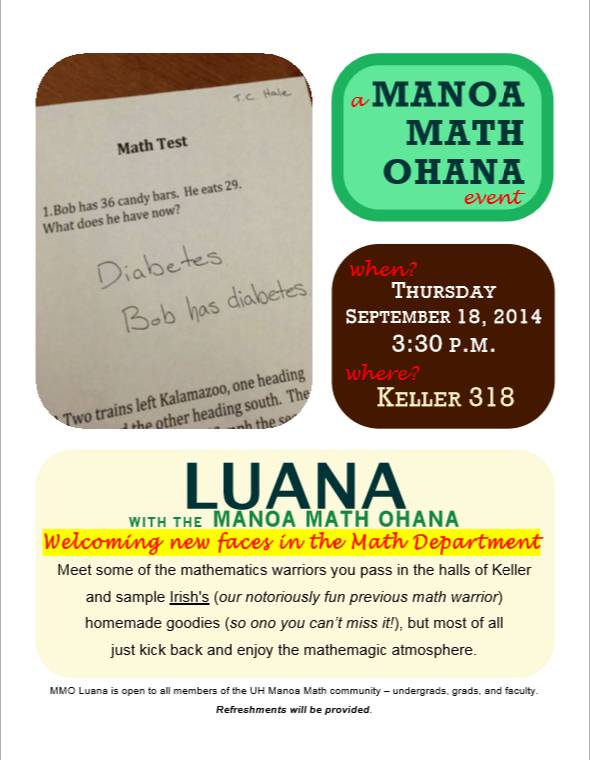 Luana is open to all members of the UH Manoa Mathematics community – undergrads, grads, and faculty. 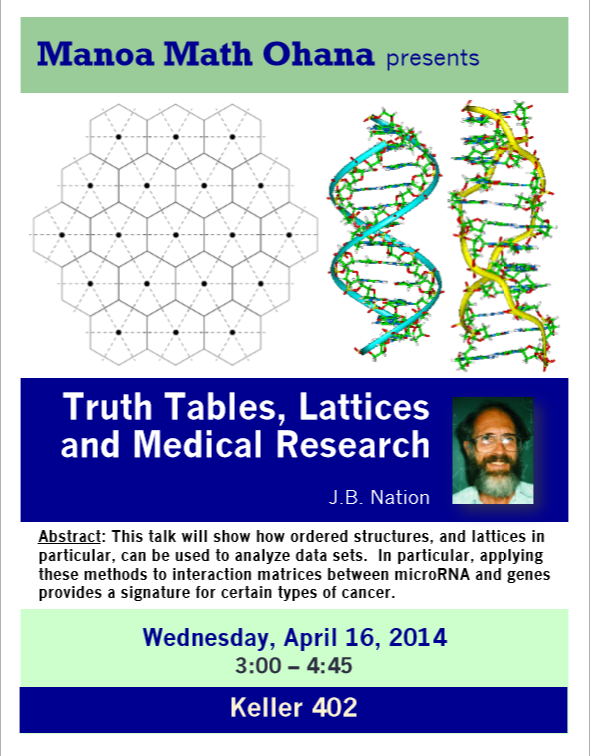 Please join us for Truth Tables, Lattices and Medical Research, a talk by Professor J.B. Nation. Refreshments: 3:00 – 3:30 p.m.
Seminar: 3:30 – 4:45 p.m.
and genes provides a signature for certain types of cancer.